Mini buratto rotativo - One glass mini rotative tumbler. 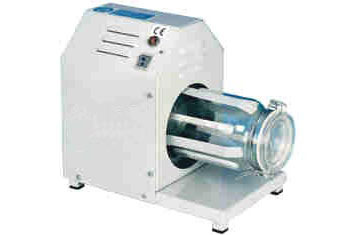 MINI polishing tumbler find its optimum use in goldsmiths, optical and metal surface traitment sectors for trimming, polishing and shining operations. Thanks to compactness and easy use, MINI tumbler is particularly proper for jewelry shops and small workrooms also for the shining of the repairs. The working principle is based on tank rotative movement with rubbing of the pieces with smooth or abrasive particles, on the basis of the required final result. This kind of surface finishing allows an optimum result with capital and running cost extremely reduced. Glass tank are of quick replacement, allowing the utilisation of various tanks for all working steps. Hermetical locking system of the glass tank give the possibility to work in safety and hygiene conditions and allows the recovery of precious particles removed during the working operations, by the water traitment in proper installations. The motor is equipped with forced air cooling and thermical protection and allows an use continuative too. Mini buratto rotativo – One glass mini rotative tumbler.